Part of the decorations were these three "necklaces" I made to show the kids what the girls' necklaces might have looked like. The middle one is actually a baby rosary that Sunshine had that looked like little seed pearls. The others were just beads that I purchased at Hobby Lobby strung on some thread. I also used my husband's carved elephant that his grandparents gave him when he was three. I thought it was clever and a couple of the kids actually remembered the quote! So, this book wasn't a huge hit with the kids in the group. And it wasn't just the pink cover. Most of them found it boring, even the girls. That's OK though. They read it and hopefully it'll mean more to them in the future. We started off with a quiz game instead of a regular discussion. I divided the kids into 2 teams and each person had to answer a question right in order to win a mini-pack of gum (get it… G.U.M…. Great Uncle Matthew). If they didn't know the answer, they could ask their team for help. Just about all of them answered their questions correctly. And they really liked the extra pictures I printed out of things like a 1930's phonograph in a red box just like Miss Dane's, a Citroen automobile just like Mr. Simpson's, Pevensey Castle which doesn't look much like a castle, a Tenniel Alice and a gold half sovereign like Petrova got on her 12th birthday. It gave them a chance to picture what some of the things in the book looked like. The activity part, they really liked and I'm wishing I had planned a longer time for this. Since the three girls first learn how to pantomime at the dance academy, I decided to play some pantomime games with the book club kids. They all did really well and enjoyed it tremendously. After that, we looked at the two fossils we own that were gifts from a dear friend. Then we pretended we were digging for fossils and dug out all the chocolate chips in a chocolate chip cookie using toothpicks and paint brushes. I told them to chip away the cookie like it was rock and brush it away from the fossils (chocolate chips). Snack time was rather perplexing, since the family in this story is very poor and food isn't discussed much, but they did have some interesting "beavers" with the good Doctors who were teaching them at home. One of the things mentioned was Vienna Cakes and ginger drink. I took Vienna Cake to mean Sachertortes since they are the most famous viennese cakes. I made a simplified version in cupcake form with candy ballet shoes on top. 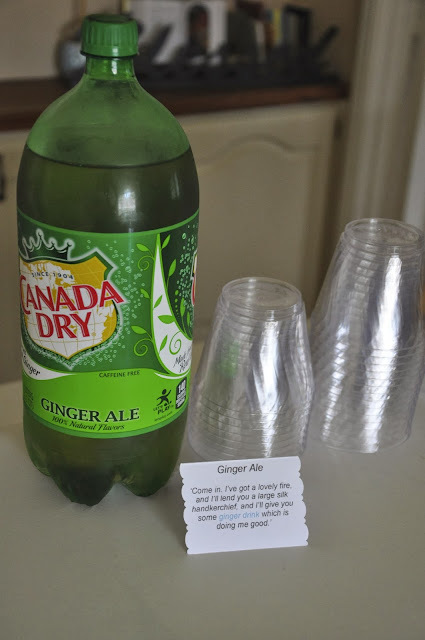 And the "ginger drink" in the book was probably ginger tea, but knowing that can be too spicy even for a seasoned tea drinker like myself, I opted for ginger ale. Next up: Kitchen Madonna by Rumer Godden. I LOVE that book. My love for all things Anglo I guess. I wish I could have been there. There is a movie version, just FYI. I loved it. Faith was bored as she was with the book as well. Must be the cultural differences. I didn't understand what's not to like. You know, Barbara, I'm sure I'm probably doing some of these book clubs for my mommy friends in my head. Wouldn't it be fun to have a book club like this for grown-ups? Yes, but can we read children's lit? ;-) And play games to win gum? "Good GUM!" I've seen ginger beer everywhere. It's non alcoholic, I'm guessing a ginger ale/root beer type beverage? I am really enjoying these book club posts and completely agree - it would be so fun to have a book club like this for grown-ups! The Vienna cakes turned out darling and look so delish! Love love love love love. Interesting that the book itself didn't much grab them. I bet all the magic you created for them above will go a long way toward kindling more interest. I SO wish I could have been there!